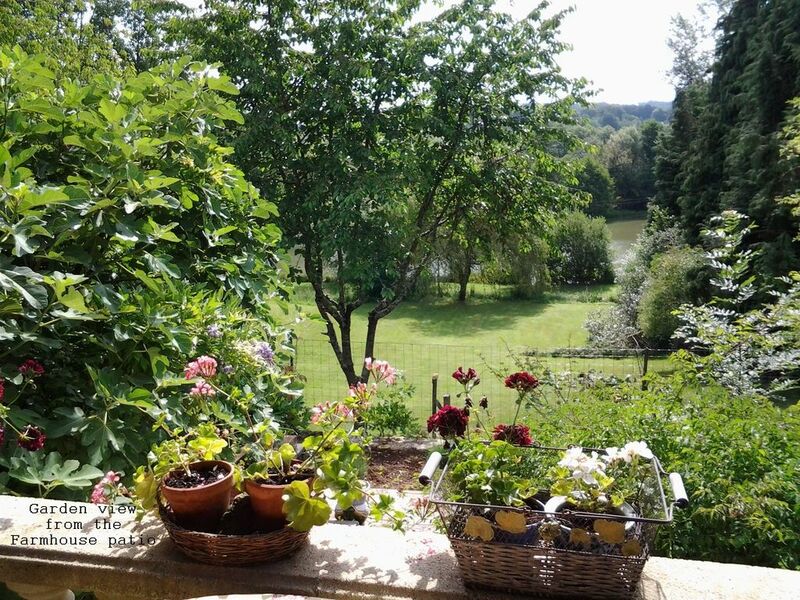 Situated on a quiet lane, the spacious, stone built, single story farmhouse and 2 story barn, have 4000 m² of private gardens with views of a lake and surrounding countryside. You can easily walk to the picturesque village of Saint Jean de Cole, where you will find restaurants, shop, and the Tourist information office. The pictures show both the Farmhouse and the Barn. Each picture has either the word Farmhouse or Barn on it for identification. There are two large bedrooms, one with a King size bed, one with a double bed. There is a third bedroom between the double bedroom, the lounge and the bathroom with a single bed. The bathroom has an Italian style shower in addition to the bath. The farmhouse style Dining kitchen with range cooker is fully equipped. The lounge features a stone fireplace with Log burner, flat screen TV with UK channels. There are comfortable chairs and a sofa. Free Wi-Fi broadband internet access is available and the cottage has parking space for cars. There is also a large entrance hall. To the rear of the cottage, double doors go from the lounge to the a patio then to the outdoor dining terrace, the au-vent covered seating area, barbecue area and on to the private garden. Like the main house, the 2 bedroom refurbished Barn is stone built and has original old beams. The new interior created, in 2016, has an open ground floor area of 40 meter² where there is a lounge, dining area and kitchen. Double patio doors to the rear lead to a dining-terrace with a view over the garden to the lake on the land next to ours. Stairs go up to the two good sized bedrooms - the double (with en-suite shower room) has a view over the gardens. Next to the twin bedroom there is a separate bathroom with a shower over the bath. Oak beams, stone walls and chestnut wood floors are featured in the bedrooms which have antique wardrobes and dressing tables. Like the main house, the Barn is fully equipped. It has a new flat screen TV with UK free-view channels and Wi-Fi. It has its own entrance, parking area and outside seating area to the rear. The house and converted barn are separated by a section of the original Barn and outside, a hedge and garden gate. This gives privacy from the other section of the property. Each has its own access to the main garden. Alternatively, together they make ideal accommodation for a family or group of friends. You may want to pick a peach, plum, pear, apple or a few cherries from the trees in the orchard or just sit and watch the wildlife including red squirrel, deer, coypu, buzzards, that pass by the garden from time to time. We will be here to welcome you and will always be close by if needed. You can rent the main house for 4 (plus an additional person in bedroom three) or the Barn for 4. If you wish to book both the house and the Barn please contact us for a quote. We have lived in France since 2004. Having lived in the Perpignan area, we decided to move to St Jean de Cole in April 2014 after discovering this beautiful village. The house enjoys the peace & quiet of the countryside but the village is just a short walk away. The view at sunrise is stunning - makes a brilliant start to the day. Good quality good size towels provided PLUS we also provide "beach" towels for use on the loungers. You can take them to the local lake beach or canoe trip. Around 25 mtr² with wood beam ceiling and original stone fireplace fitted with Godin log burner. Flatscreen TV with freeview UK channels. Comfortable sofa and chairs. Large Dining kitchen seats 6. Fully equipped. Range cooker, Fridge freezer, washing machine, microwave 3 antique pine dressers and a pine farmhouse table. Tiled worktops with plenty of storage. Public tennis court in the village for a small fee. The village shop is open every day including Sunday mornings. There are several supermarkets in nearby Thiviers (6km / 3.5 miles). We found this beautiful and characterful property to be clean, spacious and very well presented. It lacked nothing that we needed, and was comfortable to live in, with plenty of outside space to chill out in. John and Carolyn provided a very warm personal welcome and a useful welcome pack which included wine, cheese and milk. During our stay we had a couple of very minor issues which were fully dealt with within a couple of hours of informing the owners. Saint Jean de Cole is a very picturesque little village, but we particularly loved Brantome, a local town, which is a real gem of a place and has a wide range of restaurants and shops. The cottage location was a little further away from the Dordogne river itself than we had realised - we hadn't done our homework properly, but we made the journey twice and the towns (especially Sarlot) and villages (Domme, Belves, Beynec, Monpazier, etc.) are well worth the trip. Overall, we thoroughly enjoyed our holiday and will visit the Dordogne again. Katrina R.Where do you live? Just back from a relaxing week at L’Ancienne Ferme. We were looking for a comfortable base with a king-sized bed, and the property did not disappoint. We stayed in the farmhouse which is the owner’s home in the winter months and it was beautifully furnished and fully equipped; with a lovely bathroom and garden. St Jean de Cole is a beautiful village a short drive away and we found some good restaurants there. Worth noting though that a couple of the restaurants were beginning to close for the end of the season, towards the end of September. The owners were helpful but not intrusive. If you’re after a relaxing, quiet break in rural France we can recommend this property. This property certainly has the wow factor. Beautifully furnished and probably the cleanest gite/rentle I’ve ever been in. Carolyn and John were perfect hosts and nothing was too much trouble. The gardens are beautiful and serene, so much so we spent a vast amount of time watching wildlife and reading. My friend and I would certainly have no qualms recommending their home. Thanks to you both we are on our way home and feel we truely have had a holiday. Thanks for the review Gill and thanks for leaving the house all clean and tidy. We had a good laugh on the couple of evenings we all had together and hope we can keep in touch and see you again soon. Lovely quiet and cosy barn conversation. Excellent facilities and a great outdoor area. Dinning area with shade and a lounging area reminicent of a Roman villa, great. When we arrived all we wanted was a sit down in a shaded area with a cool drink and this was perfect. A well equipped kitchen or if you prefer a village with several restaurants to choose from about 15minutes walk away. Lovely garden to walk round and plenty of wild life. To finish a comfortable lounge and English television. Thanks for the review Lesley and thanks for leaving the house all clean and tidy. As discussed, we do hope you can return soon with your friends. A beautiful house in an amazing, peaceful setting- fabulous! We spent a wonderful fortnight at L'Ancienne Ferme, the house is beautiful and has everything you could possibly need. We were fortunate to have great weather so spent all of our time outside. The garden and the outdoor space are amazing, we loved the dining area with wonderful views over the huge garden and the lake, we ate every meal outdoors! The boys loved the lizards and all the wildlife, as well as all the space for football! The covered seating area is fantastic for an evening glass of wine or a bit of shade during the day. We found lots to do in the area and would definitely recommend the lake beach nearby, as well as Brantome and Bourdeilles. We would absolutely recommend this house, John and Carolyn were really helpful and we were so sorry to have to leave! I cannot say enough about our stay here. First of all, John & Carolyn are the most delightful people! They met us at the property and walked us through everything. We stayed in the Farmhouse and of course, it was even more charming than the pictures show (if that is possible). The property has a HUGE garden out back that is so well taken care of. There are shaded areas and sunny areas to choose from. I had my eye on the hammock but ended up loving the sectional under the covered patio. It was so lovely to wake up in the morning and sit outside with nothing but the sounds of the occasional bird and Mr. Hoot Owl. So peaceful and relaxing which is exactly what I was going for! The house is beautifully decorated and has a real relaxing vibe. The beds were very comfortable; I slept better than I had in a long time. You couldn't want for anything! John & Carolyn really have thought of everything. I would selfishly love to keep this gem to myself but it truly was one of the most delightful stays I've had and must be shared. I hope I can come back in the near future. Thanks for the lovely review Annette. It was a pleasure having you two stay here and know that you enjoyed the House, garden and the restaurants etc in the village. If you can make it back here we would love to see you both again. - opportunities abound. The Voie Verte is a 17km stretch of converted 19th century railway line linking Saint-Pardoux-la-Rivière to Thiviers via Saint-Jean-de-Côle. It’s great for summer cycling as it’s well shaded by oaks, pines and acacias. Dordogne Cycle Hire provides a range of bikes and equipment for the whole family including electric bikes. Best to contact in advance English spoken. www.dordognecyclehire.com. Being the Regional Natural Park of the Perigord Limousin we are fortunate in having well signposted and maintained pathways with a choice of routes through fields and woodland. Some routes are signposted from outside the house. We have a soft golden sand lake beach only 10 mins away at Nantheuil. Surveillance during high season and an inexpensive snack bar/café. Free access and good parking. We have some beach towels available. The Villars Cave, about 10 mins away by car, is one of Perigord’s largest underground networks and has prehistoric paintings amongst the stalagmites and stalactites. Guided tours through part of the network take around an hour. The fairy tale Chateau de Puyguilhem nearby is well worth a visit too. There are numerous stables in the area, the nearest,Les Écuries de Milhac-de-Nontron which is just a five minute's drive away. You can book for lessons or days out trekking. The National Stud headquarters at Pompadour is about an hour's drive with a lovely race course and you can tour the stables. There are Municipal courses at Périgueux and Limoges, open to the public. A 9 hole course near Excideuil (30 minute drive) with nice club house facilities. We understand you are welcome to stay all day and play as many rounds as you wish. www.essendieras.fr E-mail info@essendieras.fr Telephone (0033)(0)5 53 55 34 34 (English spoken). Canoes can be hired at Brantôme on the River Dronne and locally at Corgnac sur l'lisle (just outside Thiviers). There are also various canoe hire pick-up and drop-off locations along the River Dordogne. On the Route National RN21 direction Limoges, past Chalus. Well sign posted. Gold Panning in the area of Jumilhac le Grand is available twice weekly during July and August and can be arranged with some advance notice at other times, it usually takes an afternoon and you’re pretty much guaranteed to take home some gold you found in the river. The Chatueau here is magnificent. Open every day between June and September. During July and August there are Thursday night tours where the castle is lit by candles and the guides are in costume. We understand at least one of the guides speak English. You can walk along to the village – about 700 mtrs. It is renowned as one of the most beautiful villages in France. You could paddle in the river Cole, play tennis or table tennis and enjoy a drink or meal at one of the bars or restaurants next to the 12th century Château de la Marthonie, which is considered an ancient monument. Brantome- known as the Venice of the Perigord, is famous for its street cafes on the river Dronne and it's stunning chateau and abbey at the base of the sheer cliffs. Brantome also has a large selection of traditional french shops, a lovely park by the river with shady picnic areas and a fantastic Friday market. Follow the Richard the Lionheart Route visiting the chateaux and castles where King Richard stayed during the beginning of the 12th Century, where rumours of legend, treachery and intrigue abound. There are no less than 16 chateaux on the route, which spans the Charente, through the Perigord Limousin National Park and south into the Dordogne. Close to the city of Limoges, it is home to around 600 species of animals and birds in 45 hectares of geographical areas, african, asiatic, american plains, an australian area and a mini-farm. The 80 hectare park is also the location of Reynou Castle with landscaped walks. If you wish to stay in both the Farmhouse and the Barn gite, please contact us. The Farmhouse and the Barn Gite are separated by a 12 meter wide stone barn. The gardens at the rear of the properties are separated by bushes , plants etc and a wooden gate so each property has privacy but could be used together if you require.